Henry Farrell and Martha Finnemore, “Global Institutions without a Global State,” Oxford Handbook on Historical Institutionalism, eds. Orfeo Fioretos, Tulia Falletti and Adam Sheingate (Oxford University Press: 2016). Henry Farrell and Cosma Shalizi, “Cognitive Democracy,” Youth, New Media and Political Participation eds. Danielle Allen and Jennifer Light (Chicago University Press: 2015). Henry Farrell, “Social Institutions among Economists in the Wake of the Financial Crisis,” in Economy and Society in Europe: A Relationship in Crisis eds. Luigi Burroni, Maarten Keune and Gugliemo Mardi (Edward Elgar:2012). Henry Farrell, “Constructing Mid-Range Theories of Trust: The Role of Institutions,” Whom Can We Trust? How Groups, Networks, and Institutions Make Trust Possible (the Capstone volume of the Russell Sage Foundation project on Trust) eds. Karen Cook, Russell Hardin and Margaret Levi, Russell Sage Foundation: 2009). Henry Farrell and Adrienne Hèritier, “The Invisible Transformation of the Co-decision Procedure: Problems of Democratic Legitimacy,” Institutional Challenges in Post-Constitutional Europe: Governing Change eds. Catherine Moury and Luis de Sousa (Routledge: 2009). Henry Farrell, “Socialist Surrealism: China Miéville’s New Crobuzon Novels,” New Boundaries in Political Science Fiction eds. Donald Hassler and Clyde Wilcox (University of South Carolina Press: 2008). Henry Farrell “Privacy in the Digital Age: States, Private Actors and Hybrid Arrangements in Governing Global Electronic Networks: International Perspectives on Power and Policy, eds. William Drake and Ernest Wilson (The MIT Press: 2008). Henry Farrell, “Transnational Actors and the Transatlantic Relationship in E-Commerce – The Negotiation of the Safe Harbor Arrangement,” Creating a Transatlantic Marketplace, ed. Michelle Egan (Manchester University Press: 2005). Henry Farrell, “The Political Economy of the Internet and E-Commerce,” in Political Economy and the Changing Global Order (third edition), eds. Richard Stubbs and Geoffrey R.D. Underhill (Oxford: 2005). 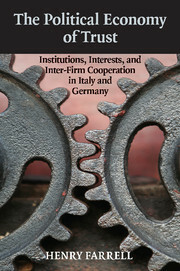 Henry Farrell and Ann-Louise Holten, “Collective Goods in the Local Economy: The Packaging Machinery Cluster in Bologna,” Local Production Systems in Europe: Reconstruction and Innovation, ed. Colin Crouch, Patrick Le Galès, Carlo Trigilia and Helmut Voelzkow (Oxford University Press, 2004). Henry Farrell, “Trust, Distrust, and Power” in Distrust, ed. Russell Hardin (Russell Sage Foundation, 2004). Henry Farrell, “Negotiating Privacy across Arenas – The EU-US ‘Safe Harbor’ Discussions,” in Common Goods: Reinventing European and International Governance, ed. Adrienne Hèritier (Rowman and Littlefield: 2002). Colin Crouch and Henry Farrell, “Great Britain: Falling Through the Holes in the Network Concept,” in Local Production Systems in Europe: Rise or Demise?, ed. Colin Crouch et al. (Oxford University Press), 2001. Italian translation published in I sistemi di produzione locale in Europa (Il Mulino 2004).